So you own Munchkin and every sequel to Munchkin and every expansion pack to every sequel to Munchkin . . . you've got all the cards, right? Wrong! There are even more cards out there, and they might be a little hard to find, so we're here to help! Munchkin Dice all have cards that come packed in with them. So do those Ducks at the bottom of that page! So do the dice bags, in fact! Want some cards in addition to a convenient way to track your level? 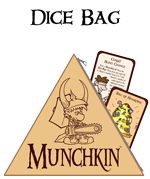 Check out the Munchkin Level Playing Field! And what are you going to keep all these cards in? Why, the Boxes of Holding, Crypts of Concealment, and Meat Lockers, of course! And they all come with cards, too!